Gunta Stölzl - excerpt from "The Development of the Bauhaus Weaving Workshop", 1931, discussing the Weimar years. "Weaving is an old craft which has evolved principles upon which even the mechnical loom must still build today. A high degree of handcraft, dexterity, skill and understanding must be acquired, and these are not, as in the case of tapestry, to be nourished by imaginative power or artistic feeling. The coming of grips with the flat loom, as its natural result, the limitation of materials, the restriction of colour, the tying of the form to the weaving process. 1923 "Gesellenarbeit" Location unknown, photograph Bauhaus-Archiv, Berlin. 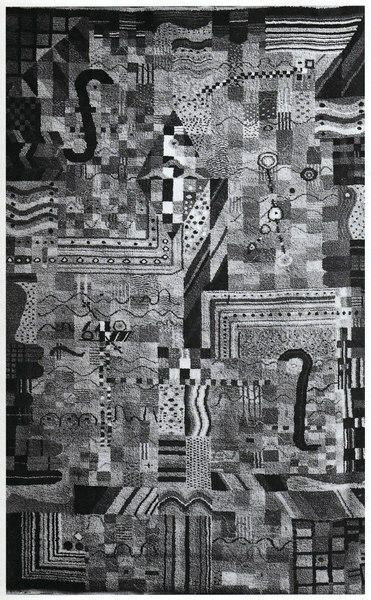 The design for this carpet survived and is at the Metropolitan Museum of Art, New York.